Watch collectors are familiar with the concept of a beater watch, a watch that’s nicked and dented, scuffed and scraped, and which you don't mind getting messed up even more. Beaters are meant to be worn while rock climbing, cleaning the garage, or moving into a new apartment. looks like it might be more than the sum of its parts. if it meets an untimely demise. Beaters don't always start out as beaters. In fact, they usually don't. A beater could once have been a Rolex Submariner that glistened in the sunlight or a Panerai that smiled every time it peeked out from under your sleeve. But an unfortunate close encounter with a brick wall or iron skillet turned that watch into a beater. The term, "beater," is an emotional cheat, a way of saying, "My beautiful Speedmaster has started a new life, and I'm happy for it." The camouflage watch, by contrast, is a watch you’ve never especially cared about about. It’s different from a beater. A camouflage watch is a handsome, inexpensive watch that to the untrained eye (non-watch collectors) looks like an expensive watch. A camouflage watch appears too fancy, complicated, rare, high-art—an engineering feat but didn't really cost all that much. Because you didn’t put your credit card company on high alert when you bought your camouflage watch, you won't shed a tear if the watch gets broken, scarred or stolen. The point of a camouflage watch is to convince everyone —save for watch guys and gals with keen eyes— that you're wearing a top watch, a watch that could only be bought with the proceeds of a winning lottery ticket. Camouflage watches look cool, exotic, or fancy. Camouflage watches camouflage their modest cost. You wear a camouflage watch when you want to wear a good looking watch, perhaps when you want to impress, but don't want to worry about what happens to that watch. When you're going to be in a place where you watch might be injured, it's a camouflage watch to the rescue. What kind of watch makes a good camouflage watch? First, budget wise, that's up to you: If you're used to spending $10,000 on watches, then a camouflage watch might cost $500. If your regular watch cost $1,000, then a camouflage watch might be more in the neighborhood of $100. There's no price guideline other than what you can afford to lose. Chinese watches often make good camouflage watches. Chinese watches work as camouflage watches not because they're cheap or cheaply made, but because they have a good quality to price ratio. With Chinese watches you not only get your money's worth but you also get a watch that looks expensive to the untrained eye. Remember, camouflage watches aren't supposed to fool watch experts. Kickstarter is a place you'll find attractive, inexpensive watches that won't embarrass you in business class. A used watch bought for a bargain on eBay also works. How about a vintage Omega Seamaster as a camouflage watch? You can find them for a song on eBay. If you pick the right camouflage watch people who ordinarily don't even notice watches will say “ooooo” when your wrist walks by. I don't recommend a quartz watch as a camouflage watch because a quartz watch's stuttering second hand gives it away as a quartz watch. 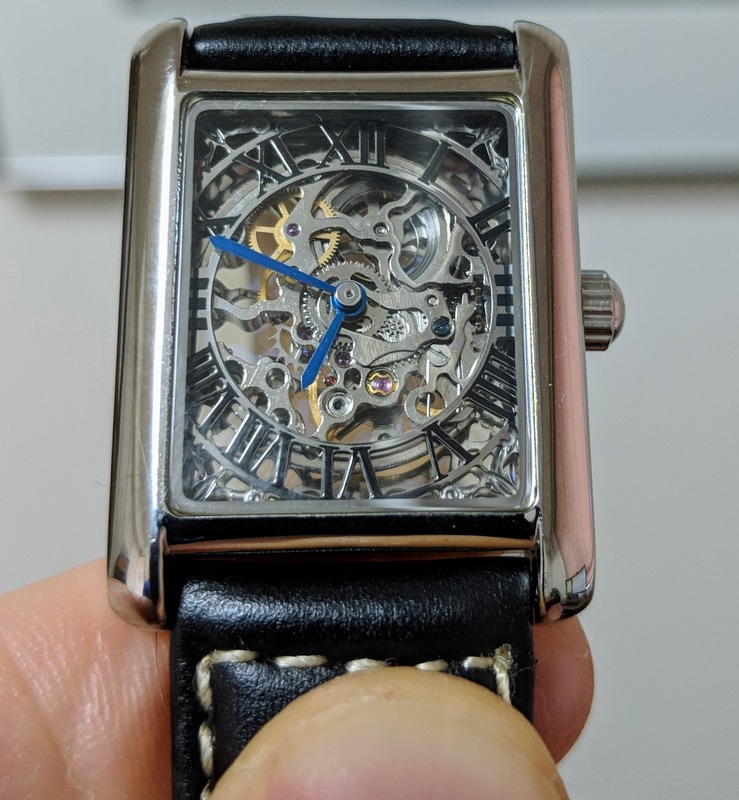 (There are some exceptional quartz watches being made, and I don't want to suggest that quartz is equated with cheap or inferior. These exceptional quartz watches, such as the Grand Seiko 9F and Bulova UHF, aren’t cheap.) One watch that fits the camouflage bill is this $75 skeleton watch on Amazon. 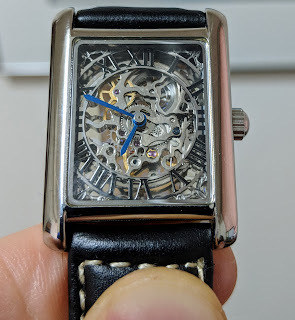 Another is this $45 mechanical Luch one-hand (also called a slow watch) made in Belarus. And whatever you do, don’t buy a replica. Replicas [URL] are cheats made by scammers. Finding a camouflage watch that will turn heads during your next kayak adventure is fun, too. You're on a quest for the most impressive, inexpensive watch you can find.